This week Kathy talks with Patty Lyons. 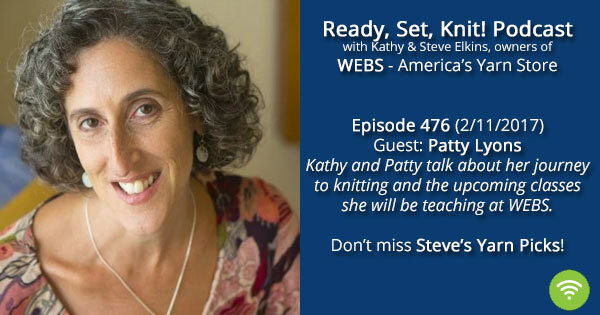 Kathy and Patty talk about Patty’s journey to knitting and some misadventures along the way. Plus, learn more about the classes that Patty will be teaching here at WEBS. You don’t want to miss out on your chance to take a class with Patty. Check out the KAL in Patty’s Ravelry group! Don’t miss our Lorna’s Laces Shepherd Sock in #RogerThat in honor of the Patriot’s Big Game win. Check out our Spring catalog online! New Class from Vickie Howell called Intro to Knitting, take advantage of the pre-order discount! Winter Classes are live! Sign up today. Registration for the WEBS Retreat opened this week and filled! If you missed out, please consider signing up for the waitlist. We had many people come off the waitlist last year! STITCHES West is coming February 23-26, 2017! Mary has worked at WEBS since 2005. She has been knitting since 2000 and also knows how to crochet, spin, and use a rigid heddle loom. This entry was posted on Saturday, February 11th, 2017 at 10:00 am	and is filed under Classes, Ready, Set, Knit Podcast. You can follow any responses to this entry through the RSS 2.0 feed. You can skip to the end and leave a response. Pinging is currently not allowed.